Gretchen Muller has, as best she can, dealt with the horrors of her family's past. Her father, a senior Nazi officer, died trying to save the life of their leader Adolf Hitler. And now Germany has the chance to be great once more. Swept up in the excitement and passion of life in Munich in 1931, seventeen year old Gretchen has embraced the life laid out for her by that leader, her Uncle Dolf. Gretchen Muller has always been his Sunshine, the girl who brightens his life, but lately she can see who the real Adolf Hitler is, but she never imagined he'd be a monster. It's 1931 in Munich, and Gretchen is the daughter of the man who risked his life to save Hitler, a man who is determined to rally the population and cleanse the Jewish citizens from Germany. All her life, she's known him as her Uncle, a man who stood by her family after her father was killed, teaching Gretchen the finer pleasures in life, from art, to music and what it is to be a good citizen and advocate for the National Socialist Party. But when she attempts to stop her brother Reinhard and his friend from beating a Jewish man to death, she's seen by the new young reporter at the Munich Times, Daniel Cohen, Daniel understand what it is to life your life in fear, a Jewish young man in the midst of a political war and cleansing of his fellow countrymen. But he sees how different Gretchen is. Although she's grown up to believe the Jewish are but a subhuman culture, she has never challenged the beliefs of those around her and her uncle... Until now. Daniel has information about the day her father was killed, he wasn't the martyr the National Socialist Party led the people to believe. Together they investigate just what happened to Gretchen's father, but with a clinically psychotic brother suspicious of her movements, what the pair know just may lead to their demise. Usually I'm not a fan of historical fiction, but I really enjoyed this. It had the making of a semi fictional storyline, mixing fact and fiction while navigating an important historical event, the rise of Hitler. 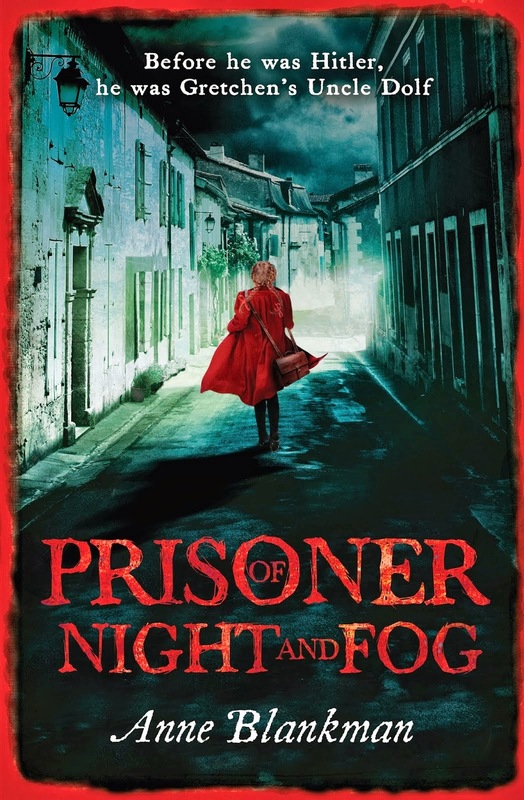 Prisoner of Night and Fog tells the story of Gretchen, a fictional character placed in the very real world of Nazi Germany. She's been brought up in a single parent family, where they relied on Uncle Dolf to keep the family afloat and run a boardinghouse, where Gretchen and her brother Reinhard live. She's been brought up to despise the Jewish, and has never questioned those beliefs. But long before she meets Daniel, she begins to see the danger in the propaganda the National Socialist Party feed into the fears of her fellow Germans. Daniel is a brilliant character, not only does he show an incredible amount of strength and determination, but he emulates a sadness for not only his people, but for those who can't see past their intolerant sectarian views. But Daniel doesn't want to educate others, seeing as it surely would have lead to his demise, but he wants to uncover a truth that Hitler and his party have hidden within their history. Although Gretchen still holds onto her beliefs, she starts to see the truth in Daniel's words, and slowly releases that her life, what she's been told, is based on a lie. I really don't know much about Nazi Germany during that era, apart from a few minutes of the documentaries seen on the National Geographic channel. Most of us see Hitler as a cold blooded tyrant, and rightly so, but Prisoner of Night and Fog shows the man with a softer side, the man who enjoyed fine art and music, cafes and entertaining. But beneath the surface, lurked the psychopath, a man that turned quickly when questioned or crossed. I really enjoyed the mix of fiction and the true to life storyline, it was incredible. I was so struck with both Daniel and Gretchen and the hint of what the two young lovers now face, as Hitler is on the verge of rising to power. I simply loved it, it surprised me and looking forward to seeing where the series goes. I have to admit, historical fiction scare me that's why I rarely try that genre but this book is interesting. I wish I live in Australia so I can join your giveaway haha! I have to give this a try soon and challenge myself with a different genre. Great review Kelly! I'm not generally a fan of historical either Ella, but this one was good. You're so involved in the storyline, that you really don't realise. Definitely pick this one up, it's brilliant. Me either. When it comes to history, I switch off. I knew that Hitler was purging Germany, but I have to confess, it never interest me. Until now. This book was unputadownable, and that's so a word. Even if you find history boring like I do, you won't care reading this. It's just THAT good! Couldn't agree more Zoe. It was really strange to think of this monster of a tyrant than anything else, but to see him begin as the doting uncle, it was creepy. Reinhard was a complete nutcase. He was truly disturbing. I never thought I'd ever say that Hitler wasn't that bad in comparison to anyone, but holy hell he was a few fries short of a happy meal. Chilling.Are you continuing with the series too? I can't wait for book two already. Yeah definitely! Especially since the author ended it on such a weird point. I was like, but but but KEEP GOING! WHERE'S THE REST OF THE BOOK?! I've been wanting to read more historical fiction during this time frame ever since The Book Thief. I'm excited that you enjoyed it so much. Hopefully I'll get to it soon! I haven't read The Book Thief as yet, have a lovely paperback copy on my shelf though. Definitely move this one up your list. It's brilliant. I'm not a fan either really, I've only read a small handful of historical novels that I've actually enjoyed, but this was certainly one of them. Apart from it being about Hitler, it didn't have that historical feel really, so I think it'll appeal to a wide variety of YA readers. I'm a sucker for a good piece of YA historical fiction, and this one looks like an interesting and different perspective on WWII. Hopefully, I'll get the chance to read it and see for myself just how good it is! Hope you entered Eugenia. This one is all kinds of awesome. Usually the premise sounds really good, but they end up boring. Loved that there was no lengthy history lessons, just an incredibly storyline. I've read some historical fiction. It depends so much on how it's written and on the story line to how much I'll enjoy it. I mostly avoid it, but Prisoner of Night and Fog sounds so good! I have come across numerous rave review for it, and I like that it is somewhat historically true, though still a fictional story. Hopefully I'll get my hands on it someday. Lovely review, Kelly! I usually do too Bree, but this one piqued my interest and so glad I read it It was just brilliant. It felt more like the marks of a dystopian, rather than historical to me. With the war, dictatorship, forbidden romance and what could be a revolution brewing. Apart from Hitler himself, that was about the extent of the obvious historical aspect. Can't wait to see what you think of this one. Glad you loved this and I loved the way you described Hitler's more sinister ways. Although the genre isn't my preference, I still managed to enjoy this read. Lovely review Kelly! It was really good wasn't it. I'm not a fan of historical fiction, but have now found a few I've really enjoyed. I think when they go heavy on trying to be era accurate, they tend to fall flat. But this one was brilliantly written. I wasn't before, but after enjoying this one so much, I'm going to start adding a few more to my shelves. Which ones have you enjoyed? I really liked the learning aspect of this...I learnt a LOT about Hitler. Mostly, you know, creepy stuff. *shudders* But historically, it was super interesting. Didn't really connect emotionally though. So did I actually. History was never my strong suit and I really didn't know much about Hitler and what Nazi Germany went through during WWII. I really didn't either, but it was incredibly entertaining and loved Gretchen's character. I am quite surprised to learn that this is a series - I am not really sure how that will be done, unless it catalogues Hitler's rise, the war, and then his downfall. Either way, I am interested to see how the author pulls it off. I am quite keen on reading this book, but I don't know if I will be a fan of the semi-historical but semi-fictional aspect. I have studied Hitler a lot, and I am also kind of wary about how someone who never knew him could portray him accurately without knowing, firsthand, exactly what he was like. I think that will really be the make or break for me with this novel - the depiction of Hitler. And for that reason alone I want to read it, haha.